While boot camp and OCS drill instructors love any humorous way to lock on and mentally destroy one of their recruits, you just know that they couldn’t have ignored Recruit Merica while he was in boot camp. 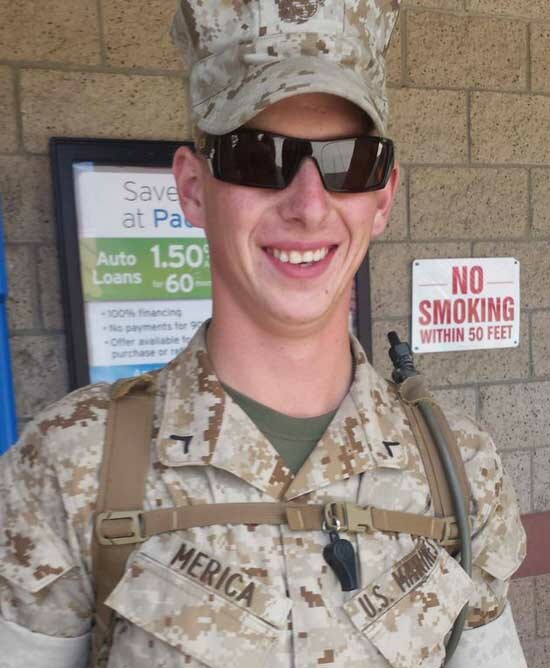 You also know – well at least my SQ Marines, Soldiers, Airmen and Sailors (and Coasties) – that whoever was before and after Merica in the alphabet was thanking their favorite deities that this guy was in their platoon, because it most likely spared them countless hours of “extra attention”. To PFC Merica, if you ever read this, we salute you, and wish you nothing but the best Marine Corps career. Semper Fidelis Marine! //Photo credit unknown; drop us a line below and we’ll give credit to whoever took this great photo. HAHA that’s something outta Major Payne or something – i bet he is popular with his supervisors! I read this article on SQ and found it very interesting, thought it might be something for you. The article is called PFC Merica: You Know His Drill Instructors Loved Himand is located athttps://www.slightlyqualified.com/pfc-merica-you-know-his-drill-instructors-loved-him.